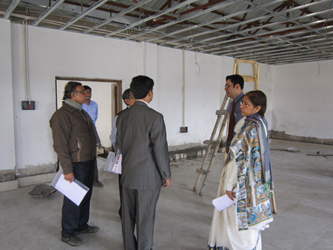 (Right) At the “Manick Sorcar Laser Animation Laboratory” (MSLAL) under construction, from left, Mr. Asit Sur, Visiting Demonstrator, Manick Sorcar, Dr, Saswati Mazumdar, Director, SISED, Dr. Ashok N. Basu, former V.C. of Jadavpur University, and Mr. Suddhasatwa Chakraborty, Asst. Professor, Electrical Engineering. At the request of Suddhasatwa Chakraborty, Asst. Professor, Electrical Engineering Dept. of Jadavpur University, Manick Sorcar managed to find time amidst his daily shows at Mahajati Sadan to attend a part of the Industry-Institute Interactive Program on “Latest Development and Challenges in different fields of Artificial Lighting Design”. Mr. Chakraborty was also the Coordinator of the program. As an author and a lighting consultant, “I just had to attend. It is a favorite subject of mine”, said Manick, whose books are in use as a text for Illumination Engineering at the same university. The venue was K.C. Roy Hall, Electrical Engineering Department. 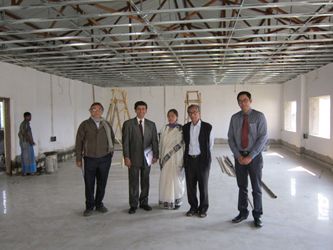 During the Coffee Break, Professor (Dr.) Saswati Mazumdar, Director, School of Illumination Science, Engineering & Design (SISED) took the lead to show the progress of the construction of “Manick Sorcar Laser Animation Laboratory” (MSLAL) at the roof of the Electrical Engineering building. Others who accompanied her were Dr. Ashok Nath Basu, former Vice Chancellor of Jadavpur University; Shuddhasatwa Chakraborty, Asst. 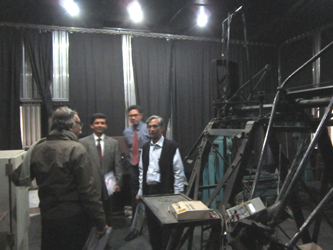 Professor, Electrical Engineering, and the Member of Academic Committee, SISED-JU; Asit Sur, Visiting Demonstrator, and Manick Sorcar. The university-financed Rs. 38 lac laboratory was planned with Manick’s guidance, who last year, introduced a course on laser animation as a part of illumination engineering. Jadavpur University is India’s first and one of the very few universities around the world to offer such a course for graduate and post-graduate studies. At the lab Manick contributed all laser equipment worth more than US $100,000. With a roof overhead, surrounding walls ready for painting, and the floor with large tiles, the laboratory showed a substantial progress over three months ago, and is anticipated to be completed in early 2013. 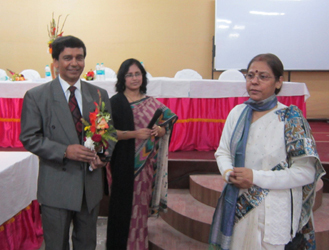 (Left) Dr. Saswati Mazumdar felicitates Manick Sorcar and thanks for his presence at the seminar. (Right) Manick thanks the Seminar coordinators for the invitation, and wished the seminar a grand success. 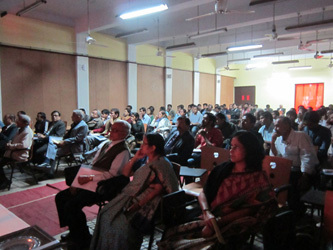 After the tour, back at the K. C. Roy Hall, Dr. Saswati Mazumdar felicitated Manick with flowers and a plaque, “on behalf of the students of Laser Animation and the Electrical Engineering faculty, I wish to thank you for finding time out of your very tight schedule and being with us even though for a short time”, she said. An apologetic Manick said “I am sorry I have to leave like this as I have a show at Mahajati Sadan to perform”. 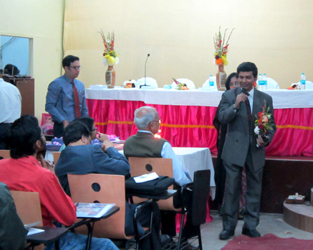 He wished the seminar with scheduled lectures from Phillips Electronics India Ltd., OSRAM India Pvt. Ltd., GE Lighting Ltd., CES, Cooper Lighting, etc., a grand success.